What a wonderful month June has been so far! The weather has been perfect for sailing—warm but not too hot, windy, but not too windy—and everyone has been in good spirits because of it. The improvements that Captain Kurt made to our Tigress, over the winter months, have her looking better than she ever has, and people are noticing! While a lot of happy memories have already been made this month, we have to admit the highlight for us has to be June 7that Farm Neck Golf Club—The Best Of The Vineyard. For those of you who don’t know, The Best Of The Vineyard is hosted every year by Martha’s Vineyard Magazine, and is, arguably, the most prestigious award of the season. This year, sixty-nine thousand votes were cast by eighty-six hundred voters, in eighty-seven categories. Voters weighed-in on everything from Best Breakfast to Best Sushi, from Best Bike Rental to Best Sailing Charter (hold your horses, we’ll get there), and everything in between. The Best Of The Vineyard has been recognizing the efforts of all of the hard working people on the island for twenty-two years now and this year, we were truly honored to be a part of it. While The Best Of The Vineyard is organized to acknowledge all of the hard work that goes into making Martha’s Vineyard the incredible place that it is, the event itself is a lot of work as well! Events like this don’t just happen and we had such a spectacular night, as did all of our friends and family, that we would like to thank some of the people who did everything they could to make the evening so memorable. First and foremost, we’d like to acknowledge Farm Neck Golf Club for the use of their beautiful space and the delicious food and drink! The food—hummus, crab dip, spinach dip, chicken croquettes, and more—was delicious! We danced all night (Captain Kurt and his brother Ryan have some serious moves) with Steve “Vineyard Steve” McCullough doing the spinning, and the Mike Benjamin Band supplying early evening jams. We love our photo taken by Randi Baird. Thanks to David Welch for the photo booth photos! Paul Schneider, Martha’s Vineyard Magazine editor was the perfect emcee for the evening. With a group like this, you can see why we were so honored to be asked to supply the door prize! Last, but not least, we’d like to give a shout out to Comcast Business for sponsoring the event. Thank you so much to everyone. It was a spectacular evening. When they called out “Catboat Charters!” as the winner of the Best Sailing Charter, we were overwhelmed. We were surrounded by friends and family in the place we love, and we were told that we had been chosen by our peers as the best. We can’t explain to you just how much this means to us—we’re still on a high. We will be for a long time. Thank you to everyone who voted for us. Thank you to all of our friends and family who came to share that moment with us. We couldn’t be more grateful. PISSAH, as per usual !! I love your talents for writing. You are the very BEST !! It was a wonderful evening, and we were thrilled to be a part of it! Wish we could’ve been there! Congratulations to Catboat Charters! 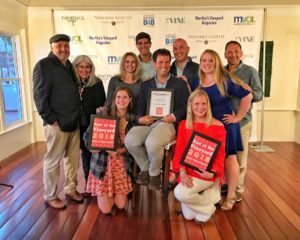 Readers of the Magazine and the Vineyard Gazette voted on 87 different categories, from Best Veterinary Service to Best Lobster Roll, whose winners were announced at the crowded event. Of course, there were a few new winners. Catboat Charters, based out of Edgartown, won Best Sailing Charter for the first time, while the appropriately-named D. Best Construction was a new winner in the Best Contractor or Builder category. The Best Dentist category had the night s most exciting finish, ending in a tie between Richard McNulty of Amity Dental Studio and H l ne Schaeffer of Island Dentistry. Yes, I would like to receive emails from Catboat Charters. Sign me up!